"Krishna says 'Just become My devotee, always think of Me, offer Me obeisances, and worship Me.' So here is Krishna. 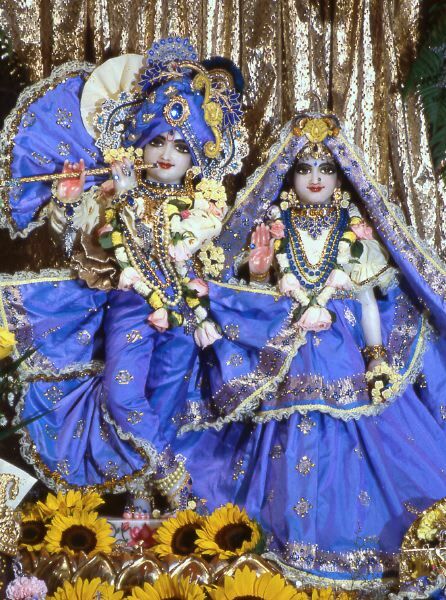 If you simply think 'Here is Krishna, Radha-Krishna Deity,' you may be fool number, rascal number one. That doesn't matter. But you are getting impression of this Radha-Krishna. Think of Him, 'Oh, how nicely Krishna is decorated.' This much. No erudite scholarship. Simply... Krishna says, man-mana bhava mad-bhakto. Here is Deity. Worship Him nicely as it is regulated principle. Even you are not worshiping, simply think of Krishna, "Here is Radha-Krishna." Impression. What is the difficulty? As soon as you see Radha-Krishna, you get some impression. Think of that impression. Where is the difficulty?"